Kaspersky, a well known company and recognized as a market leader in antivirus companies, launched a new product, Kaspersky ONE Universal Security. Kaspersky ONE protects up to 5 devices at once, against viruses, worms, Trojan horses and other e-threats. This is one of the best one-license solution to protect your PCs, Macs, Smartphones and Android tablets. Based on award-winning Kaspersky Lab technologies, Kaspersky ONE delivers security that’s optimised for each device, to provide real-time protection against dangerous Internet threats. Following the trend “post PC” of the moment, Kaspersky plans to protect all connected devices, responding to a strong demand by publisher: 73% of users would like Kaspersky a unique solution to protect its computers (PC or Mac), a smartphone and / or its tablet. A survey by Kaspersky also indicates that if 65 to 69% of users feel that their PC is secure enough, the figure falls to 41% and 27% of tablet smartphone. The survey does not specify the type of smartphone and tablets. Kaspersky has built up a solid international reputation and can therefore be designated as a benchmark for security suite. The virus remains rooted in tradition and rarely offers antivirus software with innovative features. Your Windows desktop, 2 laptops, and 2 smartphones. 2 tablets, 2 smartphones, and a Mac. 2 laptops, 2 smartphones, and 1 tablet. 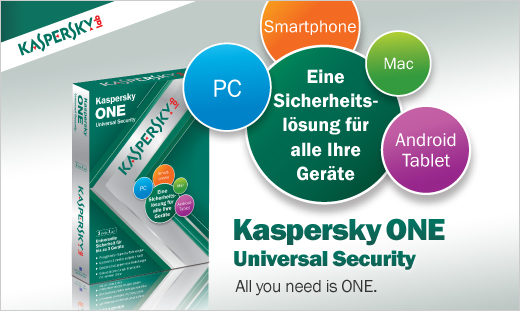 Kaspersky ONE Universal Security provides security varies by operating system used. Of course, the level of protection varies according to the operating system. For example, Windows PC users continue to enjoy the same quality of Kaspersky Antivirus and classic Mac users will have the tools necessary protection for their OS. Android, tablets and PDAs will be protected by the application. It is essential for these tools to be protected because some applications require a lot of authorizations in order to send premium SMS or disclose personal data to outsiders. Malware is also very present. Another highlight of this application, the service very useful in case of theft or loss of the device. Kaspersky One certainly is not the first such license but is an excellent opportunity for people who do not have a single operating system. Indeed, this license represents a significant saving when you see the price of the acquisition of several separate antivirus software. If you’re like me, you’re addicted to your smartphone, tablet, maybe even your laptop. What is your best tip for keeping all of your devices protected? Comment below and you’ll be entered to win a $400 Amazon gift card from Kaspersky Lab. One way to protect all of your devices is with Kaspersky ONE Universal Security. Download your FREE trial today. This is a sponsored conversation written by me on behalf of Kaspersky. The opinions and text are all mine. Official Sweepstakes Rules.If you’re like me, you’re addicted to your smartphone, tablet, maybe even your laptop. What is your best tip for keeping all of your devices secure? Comment below and you’ll be entered to win a $400 Amazon gift card from Kaspersky Lab. This is a sponsored conversation written by me on behalf of Kaspersky. The opinions and text are all mine. Official Sweepstakes Rules. If you’re like me, you’re addicted to your smartphone, tablet, maybe even your laptop. What is your best tip for keeping all of your devices secure? Comment below and you’ll be entered to win a $400 Amazon gift card from Kaspersky Lab.